This is the cutest eco-friendly purse I’ve seen in the long time. The fact that I found it in the Marshalls means that Eco products are in high demand! Yeah! The price is great too! It’s called “Lily Bloom” (what a truly beautiful name). 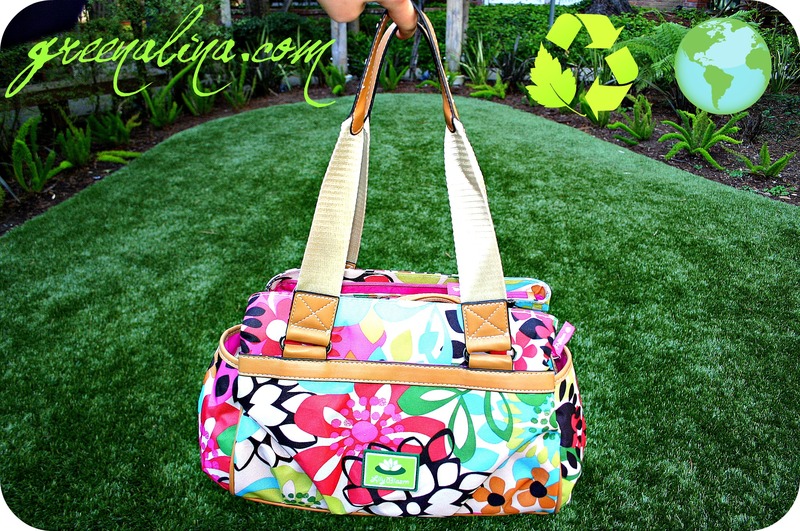 The bag is created from a signature fabric KARMA BLOOM that is made of recycled plastic bottles. It’s a dream come true – plastic waste gets a chance for redemption. I’m happy that fashion is moving in the right direction. This entry was posted in bag, creative, eco, fabric, fashion, for her, gift, karma blook, Lily Bloom, plastic, plastic bag, purse, recycled plastic bottles, Uncategorized and tagged bag, eco, eco-friendly, fashion, karma bloom, lily bloom, plastic, purse, recycle, recycled fabric, recycled plastic bottles. Bookmark the permalink. It’s gorgeous and yes its great to see eco-fashion making an impact on the commercial side. You also look totally fabulous in the shots! Aw…Thank you so much! You made my day!